I adopted this recipe from the Australian chef Neil Perry, then made changes to fit my family’s taste. 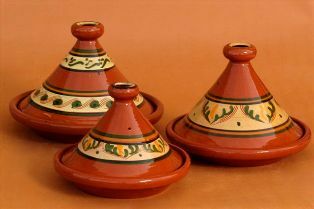 You don’t have to use the fancy clay Tagine pot, just use a regular wide, everyday pot, it’ll work just fine. Place all Chermoula ingredients in a food processor and pulverize. Heat olive oil in a heavy-based wide saucepan, add the chicken pieces and brown. Take chicken out. Fry onion. Deglaze with wine. Add back the chicken, top with honey, vegetables, prunes, apricots and lemon. Pour the Chermoula on top. Add water to almost cover. Cook for an hour. I love a Tagine on a cold Saturday for lunch with the extended family. All you need to add next to it is a big, leafy salad, couscous, and a hearty wine. I usually make a huge pot for the leftovers that are awesome the next day. Well, I’m lying, I also make a bunch of little salads to go next to the Tagine, like Lemony Tahini, baba ganoush, fresh beet salad, pickled something or other, and fried okra.